Ever dream of having your own reality TV show? 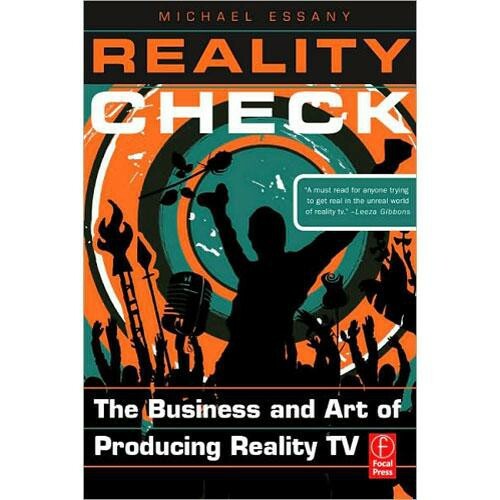 In Reality Check: The Business and Art of Producing Reality TV, Michael Essany shows you the ropes. From concept to broadcast, Michael provides guidance on how to "get in the door". With additional insights from other successful producers, this softcover book shows you how to get your ideas into the studio. The beauty of this book is that it not only shows you how to better understand the nature, complexities, and potential of the reality genre, it also provides an understanding of how to physically produce original reality programming, get past the gatekeepers and deliver quality pitches to major networks and production companies. Gain knowledge on how to legally protect yourself, your work, and your intellectual property, and learn from the glories and the gaffes of those who toiled before you. With guidelines for utilizing the internet and other multimedia outlets to create and generate revenue from reality programming and details on avoiding the professional pitfalls of the reality TV industry. This book includes compelling advice on how to parlay reality television projects into a successful and enduring career. Aspiring professionals working to break into the business; amateur producers who want to protect themselves legally and financially. About the Author: At age 13, Michael Essany ventured into the lowly world of local cable television by hosting a show from his parents' basement in Valparaiso, Indiana. Essany turned his little talk show, The Michael Essany Show, into a multimillion dollar project that quickly became one of the most talked-about reality television shows in America. By the time he was 21, he had appeared on The Tonight Show, Oprah, CNN, ET, and Access Hollywood, to name a few. E! Entertainment Television launched The Michael Essany Show to one of the highest rated debuts of any new E! reality series, and it has since been syndicated in the UK and Australia.